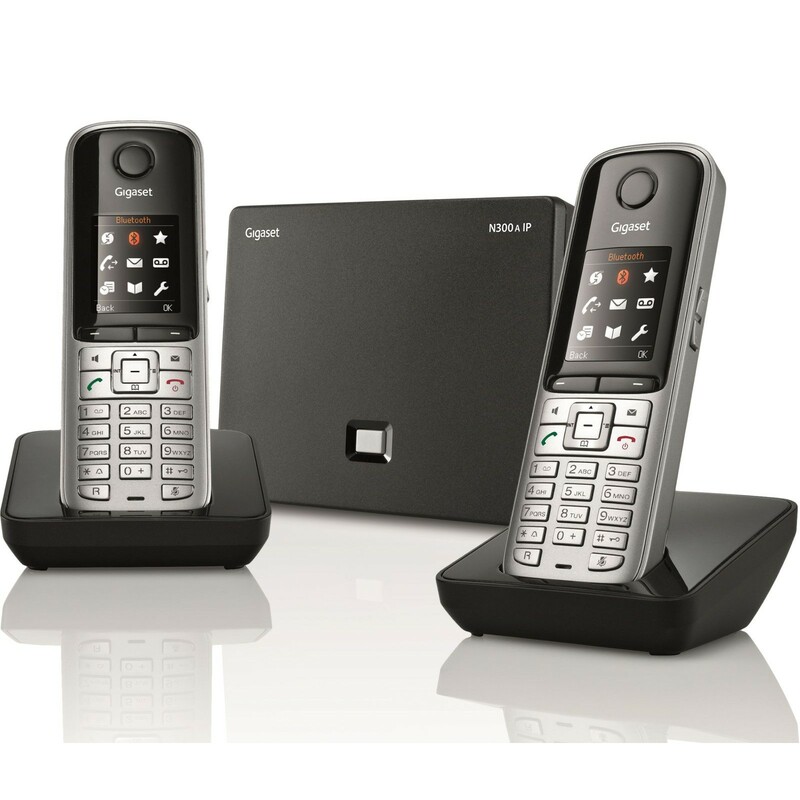 Offering outstanding features and sound quality, the Gigaset S810A IP Twin is the ideal solution for small home offices and business searching for the perfect cordless phone. With the capacity to configure up to 6 SIP accounts, and supporting up to 4 parallel calls; this is a sophisticated model, which enables you to make the most of what VOIP has to offer without sacrificing your landline. Keep all your contacts up to date with an expansive phonebook memory for up to 500 entries (each with space for 3 numbers), which can be easily synchronised with the address book on your PC or laptop via Gigaset’s QuickSync sotware. Direct access to online information means you can search online directories to conveniently look up businesses and people. And lists of the past 60 missed, dialled and received calls are saved for your reference. The Gigaset N300A IP base offers the best of both worlds with the facility to keep you connected via landline and VOIP. Take advantage of cheaper call rates from your choice of VOIP providers, and call for free to other Gigaset VOIP users; and easily switch between making calls via landline or VOIP on the handset (you could even set up one handset for landline calls, and the other for VOIP). The base also features an integrated answering machine to manage missed calls efficiently with a record time for up to 30 minutes of messages. The Gigaset S810H handsets feature a large, TFT colour display with modern user interface for ease of use. The stylish design also incorporates a side key for volume control (making it easy to adjust the sound level during a call) and an in-built loudspeaker for the convenience of hands-free. Voip phones can be difficult to set up. This I found very simple. The Handsets look good and the displays are clear and crisp. I am very pleased with both the equipment and the ligo service. First foray into voip/dect experience goes well! Basic setup was simple and quick to get operational. Some jiggery pokery with Sipgate settings but got there without too much trouble in the end. Simple feature operation of handsets was no trouble for family although a bit more education on advanced usage will be needed. PC Software could be more user friendly for base/handset setup. Bluetooth transfer bit iffy but could be my laptop! Generally very pleased I bought this set. Ease to set up and sound on this phone is great.